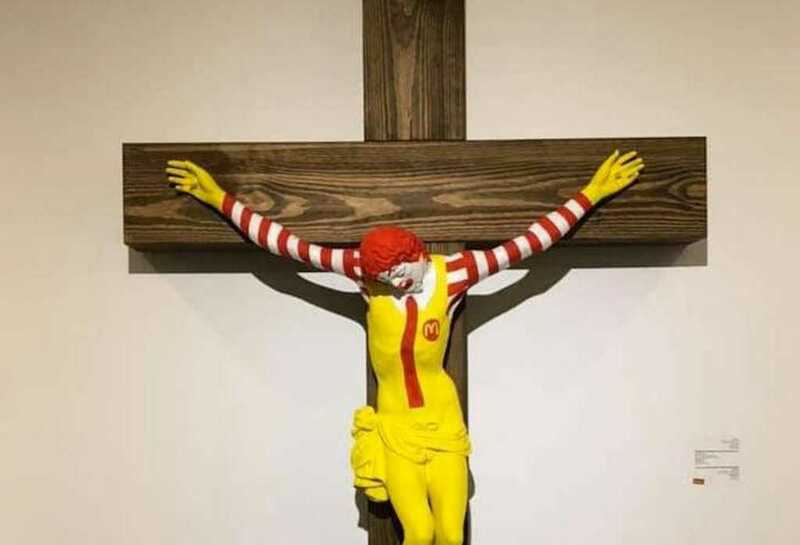 A sculpture depicting McDonald’s mascot Ronald McDonald hanging from a Christian cross sparked intense confrontations between Arab Christians and law enforcement officers late last week. Police told The Times of Israel that several hundred protesters tried Friday to force their way into the Haifa Museum of Art, where the sculpture was on display. Three officers were injured after facing a bombardment of rocks. Authorities — who were already on site because a Molotov cocktail was thrown toward the museum one day before — were forced to employ tear gas and stun guns to in order to control the rambunctious demonstrators. One protester claimed the sacrilegious sculpture, designed by Finnish artist Jani Leinonen, would not have been allowed had it depicted an image offensive to Judaism. “If they put up [a sculpture of] Hitler with a Torah scroll they would immediately respond,” he said. “Israel overtly uses culture as a form of propaganda to whitewash or justify its regime of occupation, settler-colonialism, and apartheid over the Palestinian people,” Leinonen added. He ultimately requested that his sculpture be removed from the museum. The pastor of Haifa’s Saint Elijah Cathedral, the Rev. Archimandrite Agapious Abu Sa’ada, condemned the museum display. “We denounce the exhibition and the injury to the holiest symbol of Christianity by an institution that is supposed to serve citizens of all religions,” he told Haaretz. And one day before the massive demonstrations, Israeli Culture Minister Miri Regev sent a letter to the director of the Haifa Museum of Art, Nissim Tal. In her letter, Regev encouraged Tal to remove the piece from the museum. “Disrespect of religious symbols sacred to many worshipers in the world as an act of artistic protest is illegitimate and cannot serve as art at a cultural institution supported by state funds,” she wrote. How did the museum respond? In response to the violent clashes over the sculpture’s presence in the state-funded exhibit, a museum spokeswoman told the Post the art piece is under contract from a Finnish gallery for a specific time period. Since it first went up in August, “the museum has never received a request from the gallery to remove the sculpture,” she said. Tal said Friday after the violent protests that she met with nearby church leaders and Haifa leadership. During the meeting, the museum director agreed to place a sign at the entrance of the exhibit, warning patrons the museum contains potentially offensive content. The museum is also displaying a depiction of Jesus on the cross as a “Ken” doll. You can learn more about the controversial exhibit here.